Want More Real Estate Closings? The Essential Daily Planner for Real Estate Agents is an easy-to-use daily organizer with a unique format that includes six months worth of space for you to record your daily activities and achievements. Endlessly useful, the daily log makes it simple for you to note prospecting, marketing, and sales goals while also including space for record keeping, appointments, and personal notations. The thought-provoking daily motivators offer a starting point for any agents seeking additional direction in their business. Research shows that goal setting and self-monitoring accelerates success. 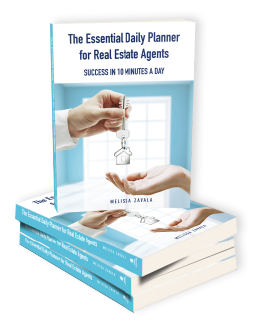 So whether you are a novice real estate agent or an experienced top producer, this daily planner will provide motivation, tools for analyzing patterns in your daily and weekly activities, and a record of your accomplishments. It’s amazing the success that you can achieve in only 10 minutes a day! You can achieve increased success in your real estate career. When you employ the strategies and use the tools in this perennial organizer, you will see increased efficiency and organization in your business. Melissa Zavala is an in demand business success speaker and author, as well as a real estate broker with thousands of short sale transactions under her belt. She leverages her experience as a short sale insider to motivate thousands of business professionals to plan their careers better, execute more effectively on their plan, and earn more because of it. Before landing in real estate, Melissa had careers in education and publishing. Most recently, she has been able to use her teaching and organizational skills while traveling the world over—dispelling myths about the distressed property market, engaging and motivating real estate agents, and sharing her passion for real estate. When she isn’t speaking or writing, Melissa enjoys practicing yoga, walking the dog, and vacationing at beach resorts.